One of the real pleasures of Words in Winter is getting to hear those fascinating insights about a favourite book, directly from the author. In this series of posts, we will be introducing some of this year’s guest speakers, and reviewing one of their works. Hopefully this will help to inform your pre-festival reading list, and maybe even help you find a new favourite. 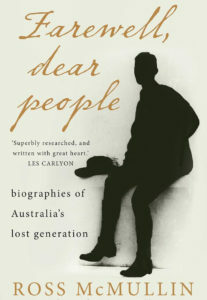 This week, Niel Vaughan has written a review of Farewell Dear People by Ross McMullin. Embedded in Australia’s story are some of history’s bravest hearts. Dr. McMullin uses a well researched & humane light to highlight ten of the Australian pillars that stood tall when the world was being remade in our history’s first world war. A war that cost young Australia more than any other allied member. From the author of Pompey Elliott comes another must read for anyone interested in the faces behind the tides of history. Award winning historian Ross McMullin will be a guest at Words in Winter this year on Saturday 18th August at 12.30pm. To book tickets to this event, go here.